The year 2009 has brought us many events from very joyful to very sad. We can't make no mention the fact about Michale Jackson's passed away was the most important event. of year 2009. His passed it's first of all a big pain for his family, fans and whole musical world as well as for this ordinary, where Michael had support many charity organizations, to help the people. His charity activity is one of the biggest philanthropy that Michael kept as an artist who's name is known all over the world, he supported not less than 37 organizations acting for ill people and being in need starting from "AIDS Project L.A." by "American Cancer Society" to "Volunteers of America" as also his own "Heal The World Foundation", besides of many organizations he helped many people he had met, he paid for expensive operations which saving live or health, he played many charity concerts from which profits were passed on charity goals, as also he gave in his own clothes for auction to help other people and finally most famous projects thanks to which kids in Africa was given many millions of $ help, by project "USA For Africa" in song "We Are The World" whether less association help for victim of World Trade Center in song record "What More Can I Give", and from that song profit for being in need was more than 50 millions of $. Heart of Michael for people being in need was undeniable as well as his genius of music, Michael is noted in history of music as icon and he appointed new standards, in history of the world he efface many borders thanks to this he changed the world and the sale of his albums is going to be beyond 1 billion for several or dozen of years. His short films are noted in history by innovation, duration or cost; "Thriller" first longest and innovative video clip in form of short film where the choreography, music and singing of Michael is making you want to dance, "Scream" most expensive video clip in history of music, cost of 7 millions of $, "Ghosts" 2nd and 1st before "Thriller" the longest short film of duration of time 39 minutes, and containing 3 songs. Michael's music achievements we can mention for hours, however his voice, dance and concerts are immortality. Michael Jackson only physically gone, he's just still alive and will live thanks to his immortality music and our great love to him that we keep inside our hearts. - Final part in creating new MJ's album. - Press conference of Michael's tour. * 1, 150, 000 tickets in 3 days (33 ticket per 1 minute). * The biggest audience for one artist in one city. - Posthumous filmed and released rehearsals to series of concerts of "THIS IS IT" in form of feature film. - New record in cinemas, "THIS IS IT" movie break down "Harry Potter" and "Lord Of The Rings" audience. - Sale of albums in half year after death MJ has reached 20 millions of copies. - Released 12kg book "Michael Jackson OPUS"
What is going to be in new year 2010? - "Michael Jackson's This is it" released on DVD & Blu-Ray with many special features. The King And His Music Will Live Forever! Stay with us and be always up to date with GeniusMJ! The FBI on Tuesday released files it collected over 17 years on Michael Jackson, most of them from the agency's support of California investigations of child molestation allegations against the entertainer. Files were opened by the Los Angeles FBI office when it was asked to lead a federal case against a California man already under arrest for sending numerous threatening letters. The manwho falsely claimed to be the son of mobster John Gottihad staked out Jackson's house and threatened to kill him, the U.S. president, and others. He was ruled incompetent to stand trial and sent to prison for two years. Cost of DVD disc is over 30$ and Blu-ray disc is over 40$ according to Amazon.com (price without special option of Pre-order with saving money). Michael Jackson might be dead, but he's already one Grammy up on Taylor Swift this year. Jackson joins the equally deceased Bobby "Mack the Knife" Darin, as well as the very-much-alive Leonard Cohen, Loretta Lynn and conductor André Previn among the honorees. The special statuettes will be presented at an invite-only ceremony on Jan. 30, a day before the big show airs on CBS. On October 26 was released soundtrck song called "This is it". Several days ago has been released official music video to this song. The clip is made of some scenes from "Michael Jackson's This is it" movie and few new scens from rehersals not included to movie. Charges relating to MICHAEL JACKSON's death will have to wait until the New Year (10) because prosecutors and police investigators are still wading through evidence. The officials have called in medical experts to help them analyse the evidence they have gathered, according to the Los Angeles Times newspaper. A source tells the publication that a decision on whether or not criminal charges will be filed is "months rather than weeks away". Jackson's personal physician, Dr. Conrad Murray, who provided the pop star with the anaesthetic propofol which caused the King of Pop's death in June (09), has been identified in search warrants as a suspect in a manslaughter investigation. Murray has repeatedly denied any wrongdoing and insists that he gave appropriate medical aid when he found Jackson in distress and not breathing. His attorney has stressed that Murray is co-operating with authorities. The Los Angeles county coroner's office determined that Jackson died from "acute propofol intoxication" combined with sedatives, and declared his death a homicide. The movie Michael Jackson's This Is It will be available on DVD and Blu-Ray on January 26, 2010. Awards have been recived by his brother Jermaine Jackson. On Monday October 26th will be released brand new album which is inspiration for going out on October 28 "Michael Jackson's This is it" movie. As for King Of Pop interest of his new album is so huge that the album just before its premiere is already Gold. The tempo of ordering albums from polish music stores around Poland, the album seems going to leave Gold status to be after weekend already Platinum. 2 CDs album besides of premiere of new single "This Is It" including also 36 pages booklet stylized on tour book of "This Is It" tour, full of 100% unpublished before pictures from rehearsals which were making for his tour at O2 Arena in London. No stranger to the Soul Train stage, the late King of Pop will be honored posthumously at the forthcoming 2009 Soul Train Awards. Michael Jackson's contributions to music will be recognized with a special "Entertainer of the Year" award during the show, scheduled for November 3rd in Atlanta. Michael Jackson and many of the Jackson family have made appearances on Soul Train programming at the start of their careers. The memorable 1972 Jackson 5 performance of "I Want You Back" is still remembered because of the incredible showmanship. Check out the 2009 Soul Train Awards on Sunday, November 29th at 9pm on Centric. On Tuesday October 27th, beginning at 7pm EST, MichaelJackson.com will be streaming live coverage from the Red Carpet Premiere of Michael Jacksons This is It in Los Angeles. The gala of awards takes place on November 22, 2009. The Michael Jackson song "This Is It," released Monday, was co-written and recorded in 1983 with singer-songwriter Paul Anka, Anka and the Jackson estate confirmed Monday afternoon. Jackson's estate and Sony Music Entertainment did not realize this history when they picked the song out of boxes of tapes in their archives, leading to a big surprise Monday when Anka called them, Anka said. Jackson, who became busy with the success of his "Thriller" album, never finished the duet recording that was intended for Anka's "Walk a Fine Line" album, Anka said. Latin hip-hop singer Safire recorded and released the song in 1990 -- under the title "I Never Heard," Anka said. "Somebody just innocently found this tape and did not know somebody recorded it with him," Anka said. Estate spokesman James Bates acknowledged to CNN that the "song was written with the legendary Paul Anka." "We picked the song because the lyrics were appropriate given the name Michael gave his tour," Bates said. It was just a coincidence that the song's first words were the same as Jackson's last planned tour, Anka said. Monday's release of the lilting love song was part of the promotion for the Sony movie "Michael Jackson's This Is It," which comes out in two weeks. Anka said it was "an honest mistake" that the estate's special administrators quickly resolved Monday. "They realized the mistake," Anka said "They apologized and they've given me rightfully what I own. It's 50-50, right down the middle." Michael Jackson may be gone, but he isn't finished releasing new music. There may be plenty more to come for his fans, whose continued devotion (and spending) has brought Jackson to the top of the charts; his collection "Number Ones" is the best-selling album of the year so far, eclipsing records by Taylor Swift, Eminem and U2. Jackson died June 25, and Sony and the Jackson estate have only begun what is expected to be a long process of musical archaeology. If "This Is It" is any guide, the provenance of leftover Jackson songs might be difficult to establish. It is not clear when the song was written or recorded, Stringer said, and Sony originally believed that the tape was made around the time of Jackson's 1991 album "Dangerous." But it could have been much earlier, perhaps even as early as the album "Off the Wall," from 1979. "This Is It" was also to have been the title of Jackson's 50-concert run in London, although the synergy is unclear; Stringer and others with knowledge of the production say the song was not part of it. It will, however, be included in the soundtrack for the film, along with a poem titled "Planet Earth," standard versions of 14 of Jackson's hits and a few 1980s demos. The album goes on sale Oct. 27, and the film is due out the next day, but the newly released song will not be sold separately as a single. Jackson recorded with a variety of collaborators and often left his vocals incomplete, Stringer said. Since Jackson's death numerous producers have come forward saying they had recorded with him. One likely project, Stringer added, would be a 30th-anniversary treatment of "Off the Wall," for which Sony and Jackson had been in discussions. Sony has rights to release any music Jackson recorded while under contract. But since there may be recordings made after that deal expired, around five years ago, other labels may also be able to make deals, and the Jackson estate has held talks with Universal about those recordings, according to people who are familiar with the discussions but are not authorized to speak publicly. Another challenge in releasing new music could be security. Both Sony and the estate have kept a tight hold on music and information and went to unusual lengths to prevent "This Is It" from leaking. Radio programmers said they had been told only on Friday afternoon that they would be getting the song at midnight Sunday  Sony also planned to post it on MichaelJackson.com  and even then they were not allowed to hear it. Even with those protections, 43 seconds of the song leaked over the weekend, apparently from Sony in Japan. Low-quality versions of the snippet proliferated on YouTube and were quickly taken down, in the familiar cat-and-mouse game of leakers and copyright holders. Enterprising fans online, however, quickly found that "This Is It" is not exactly new. It bears a strong resemblance to "I Never Heard," a 1991 track by the R&B singer Sa-Fire that was written by Jackson and Paul Anka. Stringer said that until this was pointed out by sleuthing fans, he had not known about the connection. "I really have no idea what the origins of the song are," he said. NEW YORK, NY - At the stroke of 12 a.m. (midnight) EST on October 12th, a never-before released song from Michael Jackson - a single entitled "This Is It" - will be unveiled to the world on www.MichaelJackson.com. "This Is It," a brand new song, marks yet another exciting moment in music history for one of the world's most revered artists; featuring backing vocals by Michael's brothers The Jacksons, the song plays during the closing sequence of Sony Pictures' forthcoming film MICHAEL JACKSON'S THIS IS IT and is on the 2-disc CD set Michael Jackson's This Is It, which is the stand-alone companion to the motion picture. The single artwork - a new photo of Michael taken recently at his Staples Center rehearsals - will also be disclosed. 43 sek. 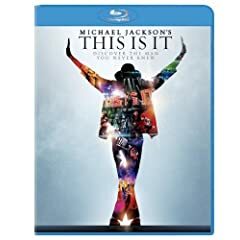 of "This is it"
Disc one of "This Is It" will feature the original album masters of some of Michael's biggest hits arranged in the same sequence as they appear in the film. The disc ends with two versions of the never-released "This Is It." This song is featured in the film's closing sequence and includes backing vocals by Michael's brothers, the Jacksons. Released date: Oct. 23, 2009. Michael Jackson's autopsy report was surprising as much for what it didn't contain as for what it did: The singer was in relatively good health for a man his age and no illegal drugs were detected in his system. Jackson's physical condition, detailed in his autopsy report obtained by The Associated Press, could be a useful tool for prosecutors as they weigh charges against his personal physician, Dr. Conrad Murray, who told police he administered a powerful anesthetic to the singer shortly before he died. The coroner has ruled Jackson's death at age 50 a homicide with his death caused by acute intoxication of the anesthetic propofol with other sedatives a contributing factor. The coroner found the propofol was administered without any medical need and that recommended resuscitation equipment was missing. The autopsy findings block a potential defense for Murray  that Jackson hid serious pre-existing conditions that increased the risk of death from the drugs he willingly took. "It clearly establishes that Michael Jackson was a healthy person whose death appears to have been directly caused by the administration of some very powerful sedatives," said criminal defense attorney and former federal prosecutor Mark Werksman. "This autopsy report seems to clear the path for a prosecution that his death was caused by an overdose." Records state Murray told police he administered 25 milligrams of propofol to Jackson. But that's a very small dose that would not have kept the star under for long, raising questions about whether Murray misspoke or police misinterpreted what he told them. The Los Angeles County coroner's report shows Jackson's weight of 136 pounds was in the acceptable range for a 5-foot-9 man. His heart was strong with no sign of plaque buildup. His kidneys and most other major organs were normal. The report provided details about Jackson's state from head to toes. Osteoarthritis was visible in the lower spine and some fingers. The coroner found depigmentation of his skin around his chest, abdomen, face and arms. The report also said he was actively producing sperm. Executives at the law firm which defended MICHAEL JACKSON during his 2005 child molestation trial are demanding $341,452 (GBP227,635) in unpaid fees from the late star's estate. Los Angeles-based law firm Mesereau & Yu filed court documents on Friday (25Sep09) claiming the sum is owed for work on the case between July 2005 and February 2006, reports TMZ.com. The case blighted Jackson's personal life until his tragic death in June (09) - causing many of his former friends and fans to keep their distance from the King of Pop. Jackson was acquitted on 14 charges of child molestation in June 2005 - a year-and-a-half after he was accused. Date: September 29, 2009 "This is it" is breaking records again! Unprecedented Sell-Outs Reported Worldwide For 1st Showings Of "This Is It"
Sony Pictures Entertainment, in conjunction with Sony Music Entertainment, today announced that the first 24-hours of pre-sales activity for Michael Jacksons This Is It has resulted in record-breaking sales throughout the world as fans secure the first tickets to the two-week, limited engagement of the highly-anticipated motion picture. With reports still coming in from nations around the world, it is believed no movie in history has generated so many ticket sales so far in advance of its release. In North America, online ticket sellers Fandango and MovieTickets.com report that there is extraordinary demand for the film with hundreds of showtimes already sold out after one day of pre-sales. Some 80% of all online ticketing service transactions were for the film, which will debut in some markets with special advance showings the evening of Tuesday, October 27 and will open worldwide on Wednesday, October 28. The film is directed by long-time Jackson collaborator Kenny Ortega. Domestically, an unprecedented number of shows for the two-week engagement have sold out in the first 24 hours of ticket availability in locations from coast-to-coast, including such cities as Los Angeles, San Francisco, Houston, Nashville and New York, among others. Internationally, exhibitors from London and Sydney to Bangkok and Tokyo have experienced the same epic demand. In London, Vue Entertainment's Film Buying Director Stuart Boreman said Michael Jackson's This Is It sold more than 30,000 tickets in its first 24-hours, setting the biggest ever one-day sales record in the UK, eclipsing advance buying for films including Harry Potter and The Lord of the Rings. "I've never seen anything like it in the 25 years I have been film buying," Boreman said. "It's a true phenomenon and sales show no sign of slowing down." In the United States, more than 500,000 fans performed searches for showtimes on the official www.thisisit-movie.com website. Online buzz for Michael Jacksons This Is It was 60 percent higher Sunday than for any other upcoming film. In Japan, more than $1 million in ticket sales were recorded within the first 24 hours of their release, setting an advanced-sales record unmatched by any movie in history. Staggering advance sales were reported in Australia, where tickets for Michael Jackson's This Is It purchased through Village Cinemas exceeded the lifetime pre-sales of such blockbusters as Transformers, and X-Men Origins. In Bangkok, Thailand, fans lined up at box office ticket counters throughout the city, and by the end of the first day, all tickets for the first showings across Bangkok were sold-out. In Los Angeles, at Regal Cinema's LA LIVE Stadium 14, fans began lining up on Thursday night for tickets to some of the city's first public showings, and within hours of Sunday morning's starting bell for advance pre-sales, the exhibitor reported selling out of all 3,000 of their seats for shows on Tuesday night October 27th. Sell-outs at theaters in France are also being reported; thousands of fans lined up at The Grand Rex in Paris and quickly bought out the films first screening there. Record-setting sales also were recorded in Germany; hundreds of fans lined up outside one theater in Munich at midnight to await the opening of the box office. As one German exhibitor noted, "Something like this never happened before in Germany." Record sales and sell-outs are also being reported in Holland, Sweden, Belgium and New Zealand, among other countries. Moviegoers worldwide can get information for the two-week limited engagement by visiting www.thisisit-movie.com. For fans wishing to purchase tickets in the US, you can do so through either Movietickets.com or Fandango. Michael Jacksons This Is It will offer Jackson fans and music lovers worldwide a rare, behind-the-scenes look at the performer as he developed, created and rehearsed for his sold-out concerts that would have taken place beginning this summer in Londons O2 Arena. Chronicling the months from March through June, 2009, the film is produced with the full support of the Estate of Michael Jackson and drawn from more than one hundred hours of behind-the-scenes footage, featuring Jackson rehearsing a number of his songs for the show. Audiences will be given a privileged and private look at Jackson as he has never been seen before. 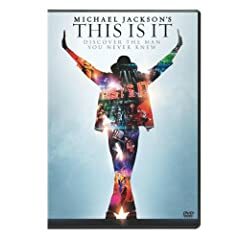 In raw and candid detail, Michael Jacksons This Is It captures the singer, dancer, filmmaker, architect, creative genius, and great artist at work as he creates and perfects his final show. Kenny Ortega, who was both Michael Jackson's creative partner and the director of the stage show, is also directing the film, which is being produced by Randy Phillips, Kenny Ortega and Paul Gongaware. Executive producers are John Branca and John McClain. The film will be distributed worldwide by Sony Pictures Releasing. For more information about the film please visit www.thisisit-movie.com. Sony Music Entertainment's Columbia/Epic Label Group will release a two-disc album "This Is It" featuring music inspired by the motion picture. The album will be available internationally on October 26th and in North America on October 27th. Be one of the very first in the world to visit this never seen before collection of Michael Jackson memorabilia. Michael Jackson: The Official Exhibition showcases some of the most personal and iconic memorabilia from The King of Pop's extraordinary life and his unparalleled career. The exhibit will chronicle Michael's rise to fame with The Jackson 5, his record-breaking solo career as a global superstar, and end with the spectacular show he had planned for The O2 Arena before his untimely death. This extensive collection will be exhibited across nine different themed galleries and include more than 250 objects. Get your Michael Jackson Exhibition Tickets Now! On October 12th, the first new Michael Jackson song to emerge since the world mourned the loss of this musical icon will be released  a brand new single entitled "This Is It." 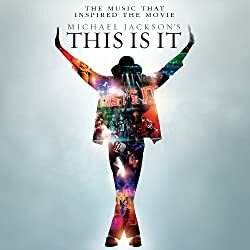 Soon after, Sony Music Entertainment's Columbia/Epic Label Group will release the two-disc album This Is It featuring the music that inspired Sony Pictures' forthcoming film MICHAEL JACKSON'S THIS IS IT. This two-disc album will be available internationally on October 26th and North America on October 27th to coincide with the worldwide release of the motion picture which arrives in theaters on October 28th and runs for a limited two-week engagement. Date: September 11, 2009 MTV TO DEBUT TRAILER FOR THIS IS IT DURING "2009 MTV VIDEO MUSIC AWARDS"
MTV is partnering with Sony Pictures Entertainment and Sony Music Entertainment to exclusively premiere the official trailer from the highly anticipated film Michael Jackson's THIS IS IT during the "2009 Video Music Awards" on Sunday, September 13, 2009 at 9PM (Live ET/Tape delayed PT). The trailer debut on the "Video Music Awards" will provide audiences their first look at the extraordinary new film which opens worldwide in theaters for a two-week limited engagement beginning October 28, 2009. Date: September 04, 2009 Michael's "final resting place"
Michael Jackson's family and about 200 of their closest friends gathered on a hill Thursday evening for their final farewell to the pop singer, who died 10 weeks ago. Jackson's burial may lay to rest some of the mystery and controversy that erupted with his sudden death on June 25. His large family was divided over where the superstar's final resting place should be, but matriarch Katherine Jackson settled on a crypt inside the well-guarded and ornate Great Mausoleum at Forest Lawn cemetery in Glendale, California. Thursday's service began 90 minutes past the announced start time, leaving dozens of celebrities -- including Elizabeth Taylor -- waiting in their seats for the 26 cars carrying the Jackson clan to arrive. It began with Jackson's five brothers -- each wearing a single sequined glove -- carrying his flower-covered bronze casket onto the outdoor stage among six large bouquets of white lilies and white roses, along with green topiaries. His three children, led by daughter, Paris, 11, placed a crown atop their father's coffin, which a family spokesman said it was "to signify the final resting place of the King of Pop." After an opening prayer by Pastor Lucius Smith, soul music legend Gladys Knight sang the gospel hymn "His Eye Is on the Sparrow." Clifton Davis sang "Never Can Say Goodbye," a hit he wrote for The Jackson 5 -- the group that featured a young Michael and his brothers. Lisa Marie Presley, one of Jackson's former wives and the daughter of Elvis, attended the service, according to the family statement. It did not mention Debbie Rowe, Jackson's second wife and the mother of his two oldest children. Macaulay Culkin, the "Home Alone" actor who spent time with Jackson during his Neverland Ranch days, was there with his girlfriend, actress Mila Kunis. Actors Corey Feldman and Chris Tucker were also seen arriving for the service. Motown founder Berry Gordy, who gave Jackson and his brothers their first big record deal, and Quincy Jones, who produced Jackson's "Thriller" album, were there. Music producer Teddy Riley, who helped with Jackson's 1991 "Dangerous" album, attended. The guest list included TV executive Suzanne de Passe, who produced a miniseries about Jackson's family, and Kenny Ortega, who was producing Jackson's comeback show. Thomas Mesereau, the lawyer who successfully defended Jackson in a child molestation trial, sat just behind the Jackson family. When the hour-long service ended, his brothers lifted Jackson's casket for a final time to carry him inside the Great Mausoleum, where he was placed in his crypt at 9:43 p.m. PT (12:34 a.m. ET Friday). The family statement said it was "his final resting place." The Los Angeles coroner has concluded preliminarily that singer Michael Jackson died of an overdose of propofol, a powerful sedative he was given to help him sleep, according to court documents released Monday. A search warrant filed in court showed toxicology reports found propofol in Michael Jackson's body. Los Angeles coroner Dr. Lakshmanan Sathyavagiswaran reached that preliminary conclusion after reviewing toxicology results carried out on Jackson's blood, according to a search warrant and affidavit unsealed in Houston, Texas. The affidavit, used to outline probable cause for search warrants of the offices of doctors who are believed to have treated Jackson, disclosed many details of drugs given to Jackson in the weeks before his death. Jackson family lawyer Londell McMillan said the report "reaffirms the very sad reality that there was a tragic and gross violation of duty and care for Michael Jackson." The publicist for Jackson's family said the "family looks forward to the day that justice can be served." "The Jackson family has full confidence in the legal process, and commends the ongoing efforts of the L.A. County Coroner, the L.A. District Attorney and the L.A. Police Department," the statement said. The Associated Press is quoting a single law enforcement official, who said the L.A. County Coroner ruled Michael Jackson's death a homicide. The Los Angeles County Coroner's office told CNN they had "no comment" on the report. An LAPD spokesman said the story did not come from their department. LOS ANGELES (AP) -- The Los Angeles County coroner's finding that the death of Michael Jackson was a homicide could mean criminal charges for his doctor, who told investigators that he administered a mix of powerful drugs to treat the pop star's insomnia hours before his death. The homicide ruling was based on forensic tests that found the anesthetic propofol combined with at least two sedatives to kill Jackson, a law enforcement official told The Associated Press on Monday, speaking on condition of anonymity because the findings have not been publicly released. While the finding does not necessarily mean a crime was committed, it means more likely that criminal charges will be filed against Dr. Conrad Murray, the Las Vegas cardiologist who was caring for Jackson when he died June 25 in a rented Los Angeles mansion. Murray told investigators that at the time of the King of Pop's death, he had been trying to wean Jackson off propofol. The doctor said he'd been treating Jackson for insomnia for about six weeks with 50 milligrams of the drug every night via an intravenous drip, a search warrant affidavit said. Murray said he feared Jackson was becoming addicted to the anesthetic, which is supposed to be used only in hospitals and other advanced medical settings. The affidavit unsealed in Houston, where Los Angeles police took materials from one of Murray's clinics last month as part of their manslaughter investigation, includes a detailed account of what detectives say Murray told them. Manslaughter is homicide without malice or premeditation. Murray told detectives that he had lowered the propofol dose to 25 milligrams and added the sedatives lorazepam and midazolam two days prior to Jackson's death, a combination that succeeded in helping the pop star sleep. The next day, Murray said, he cut off the propofol - and Jackson fell asleep with just the two sedatives. But on June 25, Murray said he tried unsuccessfully to make Jackson sleep with a series of drugs that included a 10-milligram tablet of Valium and repeated injections of two milligrams of lorazepam and two milligrams of midazolam. When they didn't work, he gave in to Jackson's "repeated demands/requests" for propofol, which the singer called his "milk," according to the affidavit. Murray administered 25 milligrams of the white-colored liquid - a relatively small dose - and finally, Jackson fell asleep. Murray remained with the sedated Jackson for about 10 minutes, then left for the bathroom, the affidavit said. Less than two minutes later, Murray returned - and found Jackson had stopped breathing. "Dr. Murray simply never told investigators that he found Michael Jackson at 11:00 a.m. not breathing," Chernoff said. He declined to comment on the homicide ruling, saying, "We will be happy to address the coroner's report when it is officially released." The coroner's office has withheld its autopsy findings, citing a request from police to wait until their investigation is complete. "This is horrible polypharmacy," he said, referring to the interaction among the various drugs. "No one will treat an insomniac like this." Murray didn't tell paramedics or doctors at the UCLA hospital where Jackson was rushed about any drugs he administered other than lorazepam and flumazenil, a "rescue drug" to counteract problems from too much lorazepam, according to the affidavit. The line between safe and dangerous doses of propofol is thin, and according to the drug's guidelines a trained professional must always stay bedside. Home use of propofol is virtually unheard of - safe administration requires both a specially trained anesthesiologist and an array of lifesaving equipment. Murray was trained as a heart doctor, not a pain and sedation specialist. Murray told investigators he didn't order or buy any propofol, but investigators served a search warrant Aug. 11 at a Las Vegas pharmacy and uncovered evidence showing Murray legally purchased from the store the propofol he gave Jackson on the day he died. Michael Jackson's burial, which originally was set for what would have been his 51st birthday on Aug. 29, has been rescheduled for Sept. 3, his family announced. The estate of Michael Jackson is expected to make £120 million by the end of the year, after raking in £60 million in the 50 days since the singer's death in June. Michael Jackson has earned £60 million since his death. They predict the pop superstar will make another £60 million by the end of the year, and expect him to overtake Nirvana rocker Kurt Cobain and Elvis Presley - who have made £450 million and £362 million respectively from beyond the grave - as the highest-earning dead celebrity in the next 12 months. Lawyer John Branca, who is co-executor of Michael's estate, said: "Clearly this will be a new record for estates that likely will not be broken. Elvis' estate makes £33million a year. This will be a bigger estate." MICHAEL JACKSON's body has been moved in secret to a new crypt, where it's been frozen. The superstar's remains were originally entombed in a crypt owned by Motown boss Berry Gordy's family at Hollywood's Forest Lawn Cemetery - but a U.S. newspaper claims his mother Katherine has moved him in secret to another building in the complex, where his body is being kept below freezing. The New York Post suggests Katherine feared grave robbers would attempt to steal the body or desecrate his grave - so she arranged for the switch and has been visiting him two or three times a week. Michael Jackson will be buried on August 29, the day the King of Pop would have turned 51, his family said in a statement on Tuesday. The private ceremony -- more than two months after his June 25 death from heart failure -- will take place in Los Angeles and "will be limited to family and close friends" the statement said. "Michael Jackson will be laid to rest at Holly Terrace in the Grand Mausoleum at Glendale Forest Lawn Memorial Park in Glendale (California) on Saturday, August 29, 2009, at 10:00 am (1700 GMT)." The announcement came as investigators said they were still weeks away from reaching a conclusion explaining how Jackson died, the Los Angeles Times reported. CULVER CITY, Calif., August 10, 2009 - Beginning October 30th, the world will have a front-row seat for Michael Jackson's final concert, as Sony Pictures Entertainment and Sony Music Entertainment release Michael Jackson's This Is It. This Is It is being produced with the full support of the Estate of Michael Jackson and will be drawn from hundreds of hours of rehearsal and behind-the-scenes footage, captured in high definition with state of the art digital sound as the late singer was preparing for his concert series in London. The film, which will also offer select sequences in 3-D, will provide a unique career retrospective and feature interviews with some of Jackson's closest friends and creative collaborators. The majority of the film's footage was shot in June, 2009 at STAPLES Center in Los Angeles, California and The Forum in Inglewood, California, as Jackson prepared for "This Is It," the series of fifty concerts Jackson planned to present at the O2 Arena in London. This Is It will offer Jackson fans and music lovers worldwide a rare, behind-the-scenes look at the performer, his career, and the stage spectacular that would have been. The film will provide moviegoers with an unforgettable front row experience compiled from extensive footage that shows Jackson's meticulous preparation for his 2009 London shows. Said McClain, "This film is not only a tribute to an artist who created excitement every moment he was on stage, but also is a fitting gift to the millions of fans worldwide who loved him and who he devoted his professional life to entertaining. John and I are thrilled to be working with Sony to build on Michael's musical legacy in a way that will generate significant proceeds for his family and for children in need." "Michael lives on through his songs, his creative genius, his body of work and his passion for his art," said Rob Stringer. "He was a perfectionist on stage and through this unique film, audiences will be able to see, many for the first time, how much Michael poured into making his performances as special as they were perfect." Said Kenny Ortega, director of and Jackson's creative partner on the This Is It concert, "The world will see what our team was so fortunate to experience, which was the full commitment, passion and creativity that Michael put into this project. He was the architect of This Is It, and we were his builders. The footage that was captured from the early stages of the production to our technical rehearsals at the STAPLES Center in L.A. will show Michael as he truly was, creatively involved with every aspect of the production, from the staging and choreography, to the music, lighting, production design and conception of the original short films and video backdrops. It will also show Michael as one of the greatest entertainers in the world and one of the industry's most creative minds. This Is It was Michael's last theatrical work and although it was still a work in progress, I think the footage will show that the process was something that Michael deeply enjoyed and that it was clear that he was on his way to another theatrical triumph." A Los Angeles Superior Court judge on Monday approved an agreement granting Katherine Jackson permanent custody of her son Michael Jackson's children. Katherine Jackson has accused the executors of her son Michael's estate of "keeping her in the dark." An agreement between Katherine Jackson, 79, and Debbie Rowe, mother of Jackson's two eldest children, cleared the way for an uncontested custody hearing. Rowe, who was briefly married to Michael Jackson, agreed not to fight for custody in exchange for visits with the children. Katherine Jackson was in the courtroom along with her daughters LaToya and Rebbie and a son, Randy. Rowe did not attend Monday's hearing, but her attorney, Eric George, spoke briefly outside the courthouse. "She's faced difficulties and pressures none of us know, and today's agreement shows that she responded with heart, integrity and selflessness," George said of Rowe. He also praised Katherine Jackson's attorneys for their part in bringing about the agreement. Michael Jackson's two oldest children -- Michael Joseph Jackson Jr., 12, and Paris-Michael Katherine Jackson, 11 -- signed consents to the agreement. He also has a 7-year-old son, Michael Joseph Jackson II, known as Blanket, with an unidentified surrogate. The custody agreement does not involve any financial payments to Rowe "apart from the continuation of spousal support payments" that Michael Jackson personally agreed to make to Rowe after the divorce, their lawyers said in a joint statement. Jackson's children have been living with their paternal grandmother at her Encino, California, home since their father's death June 25. While the coroner's report on what killed Michael Jackson has been delayed indefinitely, new evidence emerged that the singer shopped for a doctor who would give him the drug investigators suspect led to his death. A doctor of Michael Jackson says he prescribed drugs to the alias Omar Arnold. Dr. Allan Metzger, whose name appeared on a search warrant served this week, refused Jackson's request in April for the anesthetic propofol -- commonly known by the brand name Diprivan, Metzger's attorney said. Investigators suspect another physician, Dr. Conrad Murray, gave the drug to Jackson in the 24 hours before he died, according to a source, who asked not to be named because the individual was not authorized to speak to the news media. Metzger, who practices in West Hollywood, California, told Jackson during a visit to his Holmby Hills home that the drug was "dangerous and potentially life-threatening and could not be used outside of a hospital," attorney Harland Braun said. Metzger's medical records for Jackson, whom he treated until 2003, have been given to the coroner, Braun said. He said Metzger prescribed drugs for Jackson under the alias Omar Arnold and Michael Jackson, which was not illegal since he used both names together. The doctor did that because he thought it was "his duty to protect the privacy" of his patient, Braun said. Omar Arnold is one of 19 aliases listed in the warrant used by Los Angeles police and federal drug agents Tuesday to search the Las Vegas, Nevada, office and home of Murray, a Texas-based cardiologist. The warrant also mentioned Cherilyn Lee, a nurse practitioner who treated Jackson earlier this year. Lee said Jackson begged her for propofol to help him get a good night's sleep. She said she refused, telling the pop star that if he took the medicine, he might never wake up. The same warrant, signed by a Las Vegas judge, implied that investigators suspected Jackson was a drug addict. Dr. Deepak Chopra said in a recent interview that when Jackson asked him for a narcotic, he told him absolutely no. "I said to him, 'Michael, you're going to die one day from this,' " Chopra said. During a world tour in the mid-'90s, sources close to Jackson told CNN, the pop star suffered from insomnia and traveled with an anesthesiologist who would "take him down" at night and then "bring him back up." According to a report on a 2004 Santa Barbara, California, police investigation, security guards in Jackson's inner circle said he traveled the country getting prescriptions from doctors. The Los Angeles County coroner, who must rule on the cause of Jackson's June 25 death, met Thursday with the Los Angeles District Attorney, who must decide if anyone will be prosecuted for his death. During the meeting, it was decided that an announcement of the coroner's findings would be delayed indefinitely, according to a source close to the investigation. An official in the coroner's office had previously indicated to reporters that the findings would be made public within days. LOS ANGELES (AP) - Michael Jackson's personal doctor administered a powerful anesthetic to help him sleep, and authorities believe the drug is what killed the pop singer, a law enforcement official told The Associated Press on Monday. The official, who spoke on condition of anonymity because the investigation is ongoing, said Jackson regularly received propofol to sleep, a practice far outside the drug's intended purpose. On June 25, the day Jackson died, Dr. Conrad Murray gave him the drug sometime after midnight, the official said. Though toxicology reports are pending, investigators are working under the theory that propofol caused Jackson's heart to stop, the official said. Murray, 51, has been identified in court papers as the subject of a manslaughter investigation and authorities last week raided his office and a storage unit in Houston. Police say Murray is cooperating and have not labeled him a suspect. Murray's lawyer, Edward Chernoff, has said the doctor "didn't prescribe or administer anything that should have killed Michael Jackson." When asked Monday about the law enforcement official's statements he said: "We will not be commenting on rumors, innuendo or unnamed sources." Murray became Jackson's personal physician in May and was to accompany him to London for a series of concerts starting in July. He was staying with Jackson in a rented Los Angeles mansion and, according to Chernoff, found an unconscious Jackson in the pop star's bedroom the morning of June 25. Murray attempted to revive him but could not. Police searching Jackson's home after his death found propofol and other drugs, an IV line and three tanks of oxygen in Jackson's bedroom, and 15 more oxygen tanks in a security guard's shack. Propofol can depress breathing and lower heart rates and blood pressure. Because of the risks, propofol is only supposed to be administered in hospitals. Instructions on the drug's package warn that patients must be continuously monitored, and that equipment to maintain breathing, to provide artificial ventilation, and to administer oxygen if needed "must be immediately available." Jackson had trouble sleeping and the official said he enlisted various doctors to administer propofol, relying on the drug like an alarm clock. He would decide what time he wanted to awaken and at the appointed hour a doctor would stop the intravenous drip that delivered the drug, the official said. From MTV.Com: Sony Pictures is finalizing a deal to acquire rehearsal footage from Michael Jackson's This Is It concert run, with hopes of releasing it in theaters just in time for Halloween, according to Variety. Sony is reportedly paying close to $60 million for the 80 hours of rehearsal footage shot at Staples Center in Los Angeles. The footage is currently owned by Aeg Entertainment, who were promoting Jackson's run of 50 shows at London's O2 Arena. "High School Musical" director Kenny Ortega, who shot the rehearsal footage, will reportedly also sort through it to assemble the film, which Sony plans on having in theaters on October 30. Variety claims the film will feature "at least three" videos, including an alternative version of "Thriller," which was intended to be an interstitial video during Jackson's O2 shows. Date: July 16, 2009 Martin Bashir:"I never saw any wrongdoing myself"
Martin Bashir the author of "Living with MIchael Jackson" has admitted himself, that: "I never saw any wrongdoing myself" talking about his documentary/interview "Living With Michael Jackson" on air in ABC News. New Michael Jackson material will be released by the singer's label, officials have confirmed. Following his death on June 25, several artists - including Ne-Yo, Will.i.am and Akon - have revealed that Jacko was sat on a wealth of unreleased songs. Many fans feared the music would never see the light of day, but Amanda Ghost confirmed to BBC 6 Music that Jackson's label will make some of those recordings available. "I have no idea when it's coming out, but it will come out on Sony/Epic." Ghost revealed. "We haven't made any decisions because we just want to be respectful for his memory and not be seen in any way as trying to cash in." "The appetite is definitely there... If we do release anything of unreleased material, it has to be fantastic and it can't damage in any way his legacy or his legend and I won't let that happen at Epic." New music recorded by Michael Jackson before his death will be released, according to his record company. But fans will have to wait some time because the tunes aren't ready yet. The popstar had been working on new music for a few years with hip-hop and R&B stars like Will.i.am from the Black Eyed Peas, Ne-Yo and Akon. Meanwhile, Thriller Live, a stage show celebrating Michael Jackson's music, is set to go on a world tour. Michael Jackson: The Untold Story of Neverland is a new documentary produced by Larry Nimmer, who worked as a filmmaker for the Jackson defense team during Jackson's 2005 child molestation trial. During that time, Nimmer had unprecedented access to the Neverland Ranch estate and now for the first time, the public will see footage shot for the jury's virtual Neverland Tour. The documentary shows what happened at Neverland and how his accusers fabricated their allegations. The DVD also includes Michael Jackson's accusers speaking on the record, the Sheriff's raid of Neverland, the accuser making his accusations on camera during a police interview, outtakes of Michael Jackson from the Martin Bashir documentary Living with Michael Jackson, Jackson career highlights and a new ending showing fans mourning the death of Michael Jackson. More clips from the documentary will be posted on this site(nimmer.net) in the coming weeks as well as scenes of Michael Jackson memorials. Free tickets to Jackson's memorial service can be obtained by registering at Staplescenter.com. There will be 11,000 tickets for seats inside Staples Center and 6,500 for seats in the adjacent Nokia Theatre, where fans can watch a simulcast. There also will be a free worldwide video feed. AP is informing that in Jackson's house wasfound a painkiler called Diprivan. The powerful sedative Diprivan was found in Michael Jackson's home, a law enforcement official said Friday. It's still not known what caused Jackson's death at age 50. The pop star went into cardiac arrest in his bedroom and his personal physician, Dr. Conrad Murray, performed CPR while an ambulance was called, according to Murray's lawyers. Murray has spoken to police and authorities say he is not a suspect. Date: July 02, 2009 Jackson on rehearsal to "This is it"
Michael Jackson's memorial service will take place Tuesday morning in the Staples Center, the 20,000-seat coliseum in downtown Los Angeles where Jackson rehearsed his show the night before he died, according to a person who has been briefed by a representative of the family. Michael Jackson was rehearsing at Los Angeles' Staples Center. His memorial will now be there. The news comes amid the frenzy of information - some conflicting - that has followed the death of Jackson. Thursday, CNN learned the family trust created by Jackson to receive all of his assets includes his mother, his children and a list of charities, according to a person with direct knowledge to the contents of the trust. 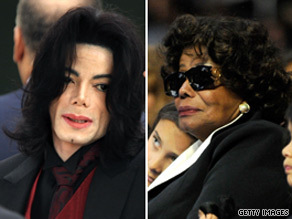 Katherine Jackson's 40 percent share would go to Michael Jackson's three children after her death, the source said. The children - ages 7, 11 and 12 - will also share 40 percent of the estate's assets and the remaining 20 percent will benefits charities designated by the executors of the will, the source said. Wednesday, a federal law enforcement official said Wednesday night that the Drug Enforcement Administration had joined Jackson's death investigation. Earlier in the day, the Jackson family said they would not hold a public or private viewing of his body at Neverland Ranch, as had been reported. And though Jackson's will, made public Wednesday, placed his entire estate in a family trust, the document that described the trust was not filed in Los Angeles Superior Court. Michael Jackson's body will be taken to his Neverland Ranch on Thursday morning for a public viewing Friday, CNN has learned. A private memorial service is scheduled for Sunday at Neverland. Also, a Jackson will written in 2002 has been found, according to family lawyer Londell McMillan. Planning is under way for a 30-car motorcade carrying Jackson's remains to leave the Los Angeles area at 10 a.m. for Santa Barbara County, California, on Thursday, a source said. The question of where Jackson will be buried remains unanswered. We've learned the story making the rounds detailing the terrible condition of Michael Jackson's body is a fake. A report in The Sun gave harrowing details of the body, but we've learned the "autopsy report" was fabricated and completely false. "The report that is being published did not come from this office. I don't know where the information came from, or who that information came from. It is not accurate. Some of it is totally false." The Jackson family has officially begun to plan funeral arrangements for the King of Pop, Michael Jackson. Tito Jackson spoke exclusively to TMZ.com and confirmed that the family was together to begin making initial funeral arrangements early Saturday afternoon around 1:30 p.m. According to Tito, the family is discussing the possibility of a public service in addition to a private one. And while the family mourns the loss of their jewel, a second autopsy is being performed somewhere in Los Angeles, reports TMZ. Yesterday, the Los Angeles County Coroner's office held a press conference after the first autopsy was performed, saying there was "no indication of foul play." The coroner's office stated that it will take four to six weeks before an official cause of death could be determined. As far as Michael's estate, Randy Jackson will take control with the help of MJ's former manager, Leonard Rowe. At the time of his death, Michael was living in a rented Holmby Hills mansion with his three children. Today, his father Joe Jackson ordered his belongings removed from the house and placed in storage. TMZ has a photograph of a moving truck on the property. Though the international community is still in shock over his death, the media has already begun to discuss the outcome of what will happen to Michael's most cherished belongings, his kids. Michael Joseph, Jr., Paris Michael Katherine, and Prince "Blanket" Michael II are rumored to have requested to stay with their grandmother Katherine Jackson. The three kids have been with Michael all their lives and are said to have no relationship with their biological mother, Debbie Rowe. If the children are able to stay with their grandparents, they will have at the Jackson family's Encino home. The Jackson family is expected to fight for custody of Michael's children. Ed Alonzo -- who also worked as a concert magician on Britney Spear's Circus tour -- was hired by the late singer to help design some of the magical illusions for Jackson's London shows. He said Jackson -- wearing a white shirt and pants -- arrived at the Staples Center in L.A. around 6:30 p.m.
"By the time that Michael came in, all we had to do was just show [the plan] to him. He was such a quick learner," he said. "He would learn this stuff in seconds. And jump right into it! The choreography, all of it... He looked fantastic." "He claimed that he felt he had a little bit of laryngitis. He said 'I'm not going to sing this full-out because I have this laryngitis.' But he looked great and these pop-locking moves that he was doing on stage with the crew were just breathtaking... He didn't seem tired. He went from one move to the next. It was an unbelievable experience to be with him and to see it all come together." "He was joking with the crew on stage," he said. "There was a cameraman on stage ... that was a foot away from him that was kind of crouched down and Michael said some kind of funny gesture like, Oh you're very close, look how close you are.' And he reached down and touched the cameraman on the top of the head in a joking manner. You could see on the screen how big Michael's image was on these projection screens. He was playful and light-hearted." "I just thought, 'Wow, he still has it,'" he told Us. "When he did 'Thriller,' I was just in awe. I stayed for a while, probably until about midnight. And then they started to rehearse the 'Thriller' number with a gigantic spider on stage and I thought, 'Well, it's getting late...' Had I known, I would have stayed another half hour and watched more." "I wasn't sure what was happening," he said. "People were just looking at their phones and looking at websites and texts that they were getting. I think the news was now coming out. [Show producer Kenny] Ortega was on and off the phone probably five or six different times. And the news was slowly coming in, but it was not definitive. And Kenny finally looked at us and said, 'We need to call a group meeting.'" Alonzo added: "He said, 'Michael Jackson was taken to the hospital. We're not sure at this point what has happened, but Michael Jackson has passed away. And then there was just this gasp. It was the words we didn't want to hear." Michael Jackson's body was moved from a Los Angeles, California, coroner's office to a mortuary Friday evening, a coroner said. 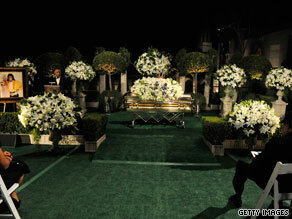 Michael Jackson's body was taken to an undisclosed mortuary late Friday. The body was moved in a van about 9:30 p.m. PT (12:30 a.m. Saturday ET), but Jackson's family asked that the location not be made public, said Ed Winter, assistant chief coroner of the Los Angeles County Coroner's Office. "We ask that you respect the family wishes," Winter told reporters. "They are all grieving in their different ways." Earlier on Friday, Craig Harvey, a spokesman for the coroner's office, said Jackson's autopsy was completed, but more testing was needed to pinpoint the cause of death. Harvey said the tests would take four to six weeks. Harvey did say there were no signs of foul play or trauma. Dielo: "I had to tell children"
Michael Jackson may have led a very private life. But for those who were close to him, he was anything but guarded. One of those people who got to know the King of Pop over the years was Frank Dileo, Michael's longtime manager and a member of Jackson's inner circle, who was at the hospital when the singer died on Thursday, along with family, friends and Jackson's children. "His three children were there. They were in a separate room while the doctors worked on Michael," Dileo told the "Today" shows Meredith Vieira on Friday. "I'm very sad for his children, his mother, his father, his brothers and sisters. It was a very rough day yesterday for everybody." In fact, it was Dileo who had to tell Jacksons three children  Prince Michael Jackson, 12; Paris Michael Katherine Jackson, 11; and Prince Michael Jackson II, 7  that their father had died after doctors worked for over an hour to resuscitate the star. "We had to tell the children. I didn't go in alone. I went in with a doctor and a social worker. The nanny was in there and Dr. Murray  Michael's personal physician. It was, as you would think," a visibly emotional Dileo continued. As someone very close to Jackson over the years, Dileo got to see a side of the pop star that few others did  as a father. "Michael was a very dedicated parent, a single parent, who took that responsibility very seriously. His whole life surrounded around those children and they around him," Dileo added. So where are the children now following their father's death? "They are with their grandmother. They are with Mrs. Jackson, Dileo said, referring to Michael's mother, Katherine. "Right now, I would think that's where they would stay." And while custody of the children has yet to be determined, Dileo said he also must focus on Jackson's financial matters, which was something that the pop star worried about for his kids. "Theres so much speculation as to a will  there is a will. A team of lawyers are gathering today and we'll sort through all the stuff for the children," Dileo explained. "[Michael] talked about making sure that his finances were taken care of  to clean up this mess so his children would be protected, so that's what I'm going to do... That's what was important to Michael." And while Jacksons death at the age of 50 on Thursday came as a shock to fans worldwide, it was equally surprising to those who were closest to the King of Pop. In fact, Dileo said Jackson had been in good spirits in the days leading up to his death. Its our time again Frank. We're going to do this!'" Besides being happy, Dileo also said Jackson seemed to be in top physical shape. "He seemed in great health. He was working out everyday," he added. Date: June 26, 2009 Michael is DEAD. LOS ANGELES (AP) -- A fire department official tells the Los Angeles Times that Michael Jackson has been rushed to the hospital. Steve Ruda (ROO'-dah) told the newspaper Thursday that Jackson was not breathing when Los Angeles Fire Department paramedics responded to a call at his Los Angeles home about 12:30 p.m. The paramedics performed CPR and took him to UCLA Medical Center, Ruda told the paper. The hospitalization was first reported by the website TMZ. Michael is DEAD. Michael's brother says, he "collapsed at home"
The Outside Organisation has released the following details regarding Michael Jackson's partnership with Swarovski and more tickets to go on sale! Excitement is building and the tension is palpable as fans wait with baited breath for the kick off of Michael Jackson's "This Is It" tour. History will be made as Michael Jackson takes his first steps on the O2 arena stage on July 13th sparkling with Swarovski crystals. Great news for fans! As the staging details are being finalised for the hottest show of the decade a limited amount of seats will be released this Wednesday, June 24th at 8am to registered fans. The iconic costumes and spectacular sets of Michael Jackson's "This Is It" tour will be encrusted with over 300,000 CRYSTALLIZED  Swarovski Elements, featuring 53 different shapes, 40 different sizes and 27 different colours! "Swarovski is thrilled to partner with Michael Jackson and his creative team for the stage and costumes. As the King of Pop, it is only natural for him to be crowned in crystal." Nadja Swarovski, Vice President Swarovski Crystal Business. Kenny Ortega, Michael's directorial partner and creative collaborator said, "Swarovski and their team have been incredible partners throughout the development of This Is It! It has been an exciting collaboration, as their support, ideas and world class products have inspired our fashion and scenic elements to a new state of the art!" Madame Tussauds has announced that they are currently creating a new Michael Jackson wax figure. The figure is being created in celebration of Michael Jackson's 40 year career and return to the stage in July 2009. Affirming Michael Jacksons mega superstar status, we are celebrating the King of Pops 'This is It' comeback with a brand new figure of the music legend. It will be the tenth time we have portrayed Jackson, making him the most featured star ever, with only The Queen having been portrayed more often. The new figure recreates the classic Jackson pose of the new tour poster  arms outstretched, pelvis thrusting and tip toed with his trade-mark trilby angled forward  and will be revealed before the eagerly anticipated tour kicks off in July. NJ promoter sues Michael Jackson, alleging breach. A New Jersey concert promoter has sued Michael Jackson for $40 million for allegedly breaching a contract to play a reunion concert with other family members. In a lawsuit filed Wednesday in federal court in Manhattan, Allgood Entertainment claims it made a deal with Jackson's then-manager to produce a reunion concert with the Jackson family this summer and possibly a pay-per-view Jackson family reunion event. The deal called for Jackson not to perform elsewhere before the event or for at least three months after it. The lawsuit says Jackson, manager Frank DiLeo and event promoter AEG broke the contract by signing to do a series of concerts in London this summer, which may also include a pay-per-view event. According to the lawsuit, AEG knew of the agreement between AllGood, Dileo and Jackson, "but due to their dominance and power in the live performance industry, coerced and/or induced Dileo and Jackson to disregard the agreements with AllGood and to work with it instead." "We've given Michael Jackson and AEG every opportunity, publicly and privately, to resolve this matter and to date we have not heard from anyone," said Patrick Allocco, Allgood managing partner. Allocco said the last contact with either camp was May 22 in Beverly Hills. Representatives for Jackson and AEG could not immediately be reached Wednesday. Allgood attorney Ira Meyerowitz said the company isn't looking to stop Jackson from performing. "What were looking for," Meyerowitz said, "is for our clients to be involved in the London concerts or be compensated for agreements they entered into." To read the official court documents, please click Doc.1, Doc.2. "This is not true; Michael Jackson was thrilled at selling 50 shows. The size and scale of this show would not be possible without an extended run, which Michael has been fully on board with from the very beginning. He has not agreed to a world tour at this point, however, he can at any time," said Randy Phillips, president & CEO, AEG Live in a statement. It was the Sun that reported that Jackson told fans outside his L.A rehearsal space that he wanted to play 10 O2 shows and then go to tour. These comments have now been rejected by AEG Live's CEO, Randy Phillips. After the King of Pop Michael Jackson postponed his first five opening shows of the This Is It run of 50 concerts in Londons 02 Arena, the tawdry tabloid tales and rumors have gotten out of control. They escalate and get worse every day. Rumor: Michael is dying from cancer! Fact: Totally untrue, and the top titans producing his show said hes had another clean bill of health from the insurance company. Hes ready to go! Rumor: Hes on a hunger strike and angry about doing 50 shows instead of the original 10 that were planned. Fact: He is not starving himself to beat cancer or protest the rehearsals schedule. Hes getting himself into shape, and both Michael and the AEG producers scheduled the additional 40 shows on the 02 Arena booking calendar if the original 10 shows sold out faster than expected! Rumor: Michael is worried hes not strong enough to perform every other night for 50 shows for 1 million fans and has skipped rehearsals. Fact: Hes attended all of the preparations and rehearsals, and my insiders report that everything is on schedule. Michael, director Kenny Ortega, dancers and choreographers will relocate from Center Staging Studios in Burbank, Calif., to London in the next two weeks to prepare the final elements. Rumor: Michael will open a $3 billion Thriller casino on the Strip. I was told that the shows will be truly spectacular and unlike anything ever seen. Michael has wrapped the video sequences for the giant projection screens being used in the staging. R&B singer Akon made British headlines, too, saying the King of Pop wouldnt be singing live. Again, another exaggerated story, my insiders say. Michael will perform, he will dance, he will sing, I was told. You cant do all three at once live, so of course there will be some pre-recorded tracks. But the fans wont have a second to be disappointed about what they will see and hear! Akon has promised to be in the front row of the July 16 premiere concert. Madonna ends a two-night run at the 02 Arena on July 5, and Michaels production people take over July 6. We are totally confident Michael will be onstage, healthy, strong and well. The insurance is in place for exactly that, and his doctors have given the green light. It will be the best ever show ever seen anywhere in the world, my top insider told me. Robin Leach has been a journalist for more than 50 years and has spent the past decade giving readers the inside scoop on Las Vegas, the worlds premier platinum playground. With the first court date in the civil suit between Michael Jackson and his former publicist, Raymone Bain, set for next week, the pop star has yet to officially name his lawyer or make any contact with the court. Bains attorneys from Cahn & Samuels have asked Judge James Robertson of the U.S. District Court for the District of Columbia for a default judgment. That would leave the singer on the hook for $44 million. In court documents filed last week, Bains lawyers said they did not know who Jacksons lawyers were and that the lawsuit itself was served to a security guard at Jacksons Los Angeles home. A hearing is scheduled for Monday on whether the judge should grant Bain an injunction that would freeze some of Jacksons assets. MJPublishing company announced about new calendar for year 2010. The calendar will be realised soon. First in U.S.A. and Japan, but few months before end of the year in Europe. Due to the sheer magnitude of the "This Is It" concerts at The O2 arena promoters and producers AEG Live and Kenny Ortega, Michael's directorial partner and creative collaborator have elected to move back a few of the opening shows in order to meet the challenges presented by such a massive and technically complex show. Organizers are determined that all Michael's legions of fans attending the opening nights get to experience the same high quality staging that is planned for all of the spectacular shows. In order to deliver a phenomenal and unprecedented show - the first show on the 8th July will take place on 13th July 2009. The subsequent shows on 10th July will be moved to 1st March 2010, 12th July will be moved to 3rd March 2010, and the show on the 14th July will be moved to 6th March 2010. Randy Phillips, President and CEO, AEG Live added, "Kenny and Michael are, at the same time, both creative pioneers and perfectionists. This show has grown in size and scope, thereby, necessitating more lead time for manufacture of the set, programming the content for the massive video elements, and, most importantly, more time for full production and dress rehearsals in the world's busiest arena, The O2. As much as we agonized over this change in the original schedule, we are sure the fans will understand when they experience the level of entertainment Michael Jackson intends to deliver while also ensuring the safety of the musicians, cast and crew and the crisp execution of the production. It is AEG Live's sincere hope that those lucky enough to have purchased tickets will have enough time to change their personal schedules and travel plans if they are coming from outside of London. We do not want anyone to miss this once-in-a-lifetime experience." Kenny Ortega, Michael's directorial partner and creative collaborator said, "After directing the Dangerous and HIStory tours, I know what the fans expect and myself and the team want to deliver a flawless production. We apologize to all disappointed Michael Jackson fans and remain extremely dedicated and focused on creating an exceptional live music experience." AEG Live stressed that anybody who cannot make the rescheduled dates for any reason will get a full refund of the ticket and booking fee. Fans can log on www.MichaelJacksonLive.com for further information and call the 24hr hotline 0844 277 9982 or email MichaelJackson@ticketmaster.co.uk. Date: May 17, 2009 New Album from Sony: The hits! The Hits is a 2 CD greatest hits album covering Michael Jackson's entire musical career. The album will be released on 6th July to coincide with his tour dates at the O2 in London. Take a look at the album page to see the full track listing. Keep checking the official website for more news about Michael Jackson's upcoming appearances at the O2. The hits album will be released on 6th July. Beverly Hills, CA, May 15, 2009  In an official statement issued today The Jacksons (Jackie, Tito, Jermaine, Marlon and Randy Jackson) have denied they were in any way involved with a proposed Jackson 5 reunion concert in Texas on July 3rd claimed this week by New Jersey concert promoters AllGood Entertainment. According to The Jacksons manager, Danny ODonovan, the original members of the Jackson 5, and younger brother, Randy, who later joined Michael and his older brothers performing as The Jacksons, were never approached about participating in the purported Texas concert event with Michael and sister, Janet. The Jacksons have said they will support Michael in fighting any legal action brought by AllGood Entertainment with regard to the promoters claim about a July 3rd concert in Texas Stadium. ODonovan said "There is absolutely no merit in this claim, and we had no knowledge of any contract with anyone, for a so-called family tour reunion. In fact, The Jacksons were never even approached about it and no offer was ever made to them." All of the Jackson brothers are thrilled that Michael is returning to the live stage this summer and are totally in support of his historic 50 concert run at Londons O2 Arena. They eagerly look forward to seeing and enjoying his This Is It! concert event. When - or if, in the view of many industry skeptics - Jackson takes the stage at the O2 Arena July 8, it will be his first extended concert run in 12 years. Doubters cite his long hiatus from performing, health problems, a onetime prescription pill addiction, age -- he is 50 -- and his reputation for flaking out on performances and business deals. "It's going to be the biggest, most technologically advanced arena show - and the most expensive -- ever mounted," Phillips said. AEG's Phillips said Jackson had "filled out" by last November, when discussions about the London concerts began. He said a four-hour physical with an independent physician this spring found no medical problems. In preparation for the shows, Jackson is doing aerobics with a personal trainer and has had no difficulty keeping up with dancers half his age during rehearsals in Burbank, Phillips said. May 12th, 2009  The streets of Hollywood are buzzing; Michael Jackson mania is in full swing 5,500 miles away from The O2 arena  the home of his historic 50 concerts this summer. Kenny Ortega, the renowned Director, Producer, Choreographer and creative talent is hard at work collaborating with Michael Jackson in the overall design and direction for the upcoming "This Is It" concert shows. Ortega previously worked on Michael Jackson's Dangerous and HIStory tours, some of the most spectacular shows ever staged. Last week, thousands of dancers flew in from every corner of the globe including Japan, Australia, South America and Europe to audition for Jackson and Ortega  all of them were chasing their dream of winning a spot to perform on stage with their idol Michael Jackson. Even after the selection process narrowed the competition from thousands of submissions to over five hundred top international dancers, there was still no dance space large enough in Los Angeles or New York to house the auditions. The producers ended up booking LA's Nokia Theatre L.A. LIVE, part of the site where the Grammy Awards are held each year, to handle the unprecedented numbers of performers who flocked to these auditions. A music promoter plans to sue Michael Jackson from performing in London this year, it is claimed that a contract was signed by Michael, which would prevent him from giving a concert until July 2010, the head of the promotion company said on Monday. AllGood Entertainment Inc said it signed an agreement in November with Jackson's manager, Frank DeLeio, committing Michael to perform in July 2010 along with his brothers and sister Janet. Under that agreement Michael Jackson cannot give another concert until the Jackson Family reunion show. AllGood Entertainment sent a cease and desist letter to Jackson in March warning him not to perform a series of 50 shows in London's 02 Arena with concert promoter AEG that are scheduled to begin in July, Allocco said. Allocco said his company's plans to sue in federal court come after failed attempts to negotiate with Jackson and reach a deal to allow the London shows to go ahead. "As of right now we've gotten zero cooperation from anyone, Frank DeLeo refuses to honor our agreement and that's why we're filing a lawsuit by week's end," Allocco said. AllGood Entertainment said this one time concert is to be set in Irving, Texas on July 3, 2009. Michael Jackson could make up to $30 million dollars for the show. Thirty million for one show is unheard of, that's why we're so frustrated," he said. "Frank DeLeo is standing in our way. AEG has been constantly frustrating our ability to get this show." Jackson's series of concerts in London also have been touted as unprecedented. AEG has said that, all together, the shows will gather the biggest audience ever to see an artist in one city. Randy Phillips, President & CEO of AEG Live, the company putting on Jacksons London shows released a statement to Access calling the claims "meritless." "We are aware of the allegations which we believe are completely meritless," Phillips said in the statement. "Rehearsals have been uninterrupted and continue on schedule." "It is with deep regret that I find myself at this place, having to file a lawsuit against my longtime employer, and someone whom I have greatly admired and respected, Michael Jackson. "Mr. Jackson and I have had a long, productive and mutually beneficial business relationship. "Unfortunately, Mr. Jackson has elected not to honor the financial obligations of our contractual relationship, despite my numerous attempts to amicably resolve this matter. I am sincerely disappointed in Mr. Jacksons failure to honor his obligations. "This lawsuit will result in some discussion about the relationship between Mr. Jackson and me. Hypothetical theories, accusations and rumors, if gauging from the past, will be many. However, all of these will be replaced in court with the truth. In 2005, Bain was fired by Michaels brother Randy just days before the singers acquittal on child molestation charges. But, in 2006 she was made General Manager of the Michael Jackson Company. "Dr. Tohme R. Tohme and Darren Julien are pleased to announce that an agreement has been reached today(04/16/09) that allows Michael Jackson to retain ownership of the Collection of Michael Jackson. There was so much interest from so many of Jacksons fans that instead of putting the items in the hands of private collectors, Dr. Tohme and Julien Auctions have made arrangements that will allow the collection to be shared with and enjoyed by Jacksons fans for many years to come. The public exhibition of this wonderful collection belonging to the King of Pop will continue through April 25th in Beverly Hills adjacent to the Beverly Hilton Hotel. "Dr. Tohme and Juliens Auction are also pleased to announce that MJJ Productions and Juliens Auction will each be making a substantial donation to MusiCares to benefit artists in need." A judge has denied an effort to stop the auction of items from Michael Jackson's Neverland Ranch. Los Angeles Superior Court Judge Brett Klein denied efforts by Jackson's production company to have the items returned before the sale, which starts April 22. Auctioneer Darren Julien and his attorney claimed victory after Friday's hearing, saying they do not expect other motions to stop the sale to succeed. The lawyer for Jackson's company, Alan Gutman, said the ruling won't affect an upcoming motion seeking an injunction to stop the sale. That motion will be heard by a different judge on April 15.
today named Leonard Rowe, the legendary concert promoter from Atlanta, as his new Manager. Rowe succeeds Dr. Tohme Tohme. with my friend to ensure a successful and historic comeback," stated an enthusiastic Rowe. promoter and agency in the music industry won the promoter a no-nonsense reputation for challenging the status quo. against rampant industry discriminatory practices." Rowe has dedicated his career to successfully promoting and touring hundreds of acts, including the Jacksons, Prince,R. Kelly and the late Marvin Gaye. Filmmaker Larry Nimmer will be releasing a documentary entitled Michael Jackson: The Untold Story of Neverland. During the 2005 trial, Mr. Nimmers footage helped show the jury exactly who Michael Jackson is, contradicting the images portrayed by the Santa Barbara Sheriffs department. The documentary goes behind the scenes of the accuser and his family, showing that they were not the perfect family that they claimed to be, examines the extreme media sensation and the Santa Barbara District Attorneys offices actions. The film is currently under consideration for broadcasting with several cable stations. According th reports from Malaysian media, an official from AEG Live said China is Michael Jackson's most desirable destination if his farewell tour extends to Asia. Millions of fans missed the past two tours in the 1990's, which missed Chinese destinations. AEG now has offers from promoters from all over Asian regions, including Taiwan, Hong Kong, Japan, Singapore, and Malaysia. If "This Is It" tour does extend, Jackson may come to Asia in the second half of 2010 and hold two concerts in each country. Japan will probably be the first destination to kick off Jackson's Asian tour. Michael Jackson wants an apology from the BBC after two comics compared his comeback to the IRA. Steve Punt and Hugh Dennis, both comedians, speaking days after three murders by IRA splinter groups, saying both Jackson and the terrorists were 80s celebrities. "I cant believe which 80s celebrities I want back less. Michael Jackson or the IRA," they said on Radio 4s The Now Show. "Steve Punt and Hugh Dennis discuss the return to from Michael Jackson to the IRA." Jackson was horrified when he heard about the joke. "Michael was told about the comments and was appalled. It was a disgusting slur. To compare him to cold-blooded murderers is not funny, it is highly offensive," according to a source. Jackson has complained to AEG Live, the promoters who are behind his 50-night UK comeback. They are deciding whether to lodge an official complaint with the BBC. It also received complaints from listeners about the comments on last Fridays show, broadcast six days after the Real IRA murdered two soldiers in Northern Ireland. Michael Jackson's "This Is It" shows, starting in July 2009 have now completely sold out! Fans queued for up to two days at the o2 box office for the general sale, which started at 7am GMT 13th March. Within a few hours, tickets to all 50 shows had sold out. AEG live have said that tickets sold at an astonishing rate of 40,000 per hour or 11 per second! Managing director of Ticketmaster, Chris Edmonds said, "We often talk about unprecedented demand, but this week we have witnessed a live entertainment phenomenon. We have seen a truly amazing level of interest and demand for tickets from fans from across the world for the Michael Jackson shows at The O2 over the last 3 days. The success of the general on-sale today has led to Michael Jackson and AEG Live adding even more dates, taking the total amount of performances to 50. Today, we saw well over 250,000 fans hitting the Ticketmaster site at 7am for the general sale tickets. Whilst queues were long we were selling tickets at an exceptional rate. This was undoubtedly the busiest demand for tickets for an event which we have ever experienced." Randy Phillips of AEG Live added, "The last week has been the most astonishing I have seen in my career in the entertainment business. I, for one, am counting the days, minutes and seconds until that first show. I just cannot wait." Date: March 14, 2009 "There are 50 shows now"
Michael Jackson has added more concerts to his "This Is It" run at the o2 arena! There are now 50 shows in total, with 30 shows between July and September 2009, and 20 shows in January and February 2010. The pre-sale allotment for the first 45 shows have now sold out, and the general sale for all 50 shows starts Friday 13th March at 7am GMT. Randy Phillips of AEG Live says, "We stopped it at 45 in the pre-sale to save shows for the public on sale, which is tomorrow". Phillips says Michael could do 100 shows in London if he wanted to, but that he has other goals such as film and recording. Phillips also says that the demand for tickets has been a "shot of adrenaline" for Michael. "He feels great. He feels reborn. He's been gone for 12 years, so there was trepidation there." Date: March 12, 2009 Jackson's Albums Soar High After American Idol Special! Michael Jackson's albums have made it to the top movers and shakers list. Less than five hours after the American Idol broadcast,The Essential Michael Jackson" has increased its sales by 2,377% and went from rank 8,001 to 323 of all music sold on Amazon. "Thriller 25" has seen an increase of 411% (ranked 171), "Number Ones" increased by 384%, and "Off the Wall" by 260%. Each of the previously mentioned albums are already within the top 25 largest increased music sales on Amazon. Since Amazon's figures are calculated based on 24-hour trends, the total impact of sales may not be realized for another day or so. Sales on iTunes are also increasing, with "The Essential Michael Jackson" showcased at the top of the home page, on a special sale in connection to American Idol. Other Jackson albums are climbing the iTunes Pop charts as well. Date: March 10, 2009 (Update)The dates are announced! additonal dates. Michael Jackson Tickets at the O2 in London will go on sale March 13 at 7am London, UK time. The presale begins March 11, 7am London, UK time. Date: March 09, 2009 Michael Jackson - "The Time Has Come"
There is a new message from Michael Jackson on his official new website! One in love, one in service and in consciousness"
Michael Jackson has filed a law suit over the auction that will take place in April according to papers filed by MJJ Productionson Wednesday. The suit claims that many items are "priceless and irreplaceable" and describes the attempt to sell them as "malicious, fraudulent, extreme, outrageous and without any legal justification whatsoever." Julien (auction house Michael is suing) was out of the country and couldn't be reached fo comment. MJJ Productions authorized the auction house to remove the items from Jackson's Neverland Ranch, according to court documents, but not to sell them without Jackson's permission. Late of more than 1 hour press conference, Michael spoke for three minutes: "Thank you all. This is it. This is it! This is it! I just want to say that these will be my final show performances in London. This will be it. This is it. When I say "this is it," it really means this is it. Ill be performing the songs my fans want to hear. This is it. I mean, this is really it. This is the finally curtain call. Ill see you in July. I love you. I really do, you have to realize that, I love you so much. Really, from the bottom of my heart. This is it, see you in July! ". Michael will be performing 10 shows, with songs that fans wants him to perform.Tickets go on sale to the public at 7am Friday, March 13th and will be available through http://www.michaeljacksonlive.com. Tickets prices: Ticket price 75 / 65 / 50 GBP, with booking fees. First show will be July 08, 2009. More than that,an exclusive new Michael Jackson video showcasing his electric performances over the years will make a record breaking debut on Sunday, March 8th at 9:30pm on ITV. The Announcement will be made at O2 Arena 1600 GMT Thursday in the British capital according to Mr. Jackson's spokeswoman. Speaking with Hollywood.tv, Christian Audigier revealed that Michael Jackson will be going on tour. He said that Michael would be traveling to London to give a press conference later in the week. While shopping on Rodeo Drive on 27th of February, Michael Jackson spoke to E! News. He said that he is "constantly" making music, but refused to elaborate or reveal a title. Date: March 01, 2009 Michael Jackson: "greatest album ever"
MTV (UK) has launched a competition to determine which album is to be considered to be the "greatest album ever" by music fans. VH1 has named Michael Jackson's "Thriller and "Bad" albums as contenders in the top 100 (MTV Base nominated "Thriller" as well), and "Thriller" has made it to the public voting shortlist. A special will air on April 10, 2009 announcing the winning album as the "greatest album ever." Top 100 countdown specials will air Feb 28th (MTV BASE, TMF) and March 1st (MTV, TWO, VH1). Fans are encouraged to vote online for the album that they consider to be the greatest ever (from the list of 27 selected albums, that is). As a huge incentive, one lucky voter will win 243 of the top nominated albums and a "Nokia Comes with Music" handset. Three other runner-ups will also receive the handset. No registration is necessary and voting can be done online, although you will need to provide contact details to be eligible for the prize giveaways. Because the countdown and winning announcement specials are set to air across a multitude of worldwide music networks, there is potential for a lot of positive publicity for the winning album. Please take a moment to vote for Michael Jackson's "Thriller" as the greatest album ever! The Grammy Museum has announced that they would be showing a "one-of-a-kind exhibit" that "will feature a selection of the elaborate clothing that has come to define the 'King of Pops' uniquely personal style." The exhibition will show "jackets worn on the Victory tour, at Jacksons 1984 American Music Awards appearance, and at the dedication of his star on the Hollywood Walk of Fame." There will be two of the Michael's famous dazzling gloves on display as well. Michael Jackson: HIStyle runs from February 7 until mid- April 2009. Visit www.grammymuseum.org for more info of this and other exhibits. MICHAEL JACKSON is being sued by the director of his music video for Thriller. Hollywood legend John Landis has accused the singer of not paying him profits from the video for the last four years. Landis, well known for directing Eddie Murphy in Coming To America and Trading Places, filed a lawsuit in Los Angeles claiming he was entitled to 50 per cent of all profits made. He also clamed that he was owed royalty payments from a behind-the-scenes documentary he directed. Landis's solicitor said: "I can't understand what they are doing to John Landis's company. "It is such a straight ahead thing. It makes no sense at all to me." A representative of Jackson had no comment to make about the allegations. The video for Jacko's 'Thriller', released in 1983, is widely regarded as one of the greatest music videos of all time which is believed to have cost $500,000 (?350,000) to make  about ten times the cost of a normal music video at the time. Producer James L. Nederlander says he has acquired the rights for a stage version of Michael Jackson's music video, "Thriller." The show will include songs from two of the king of pop's best-selling albums,"Thriller" and "Off the Wall." "The Nederlanders and Michael Jackson represent live theater and musical excellence, so let the music begin," Thome, a spokesman for Michael Jackson, said Monday in a statement. "This musical will be the exclusive Michael Jackson authorized version of 'Thriller' and Jackson will participate in every aspect of the creative process," the organization said in a news release. "I love the idea of making "Thriller" a musical. Girl meets boy, they fall in love, boy has big secret , now what?" said Nederlander, head of the company that owns nine Broadway theaters. It looks for Jackson's new album is going to apper in shops soon, now is in a final part of production. According to people of KOP forum, who were close to him during his visit in bookstore, Michael said that "he was on a selection of the tracks." More than that Jackson Jingle is reporting that also several days ago Michael said "people will be "really surprised" by the change in direction in his new album, due out early next year." It is now confirmed that Michael Jackson has moved to Los Angeles in which he has been seen around in the last few months. Michael Jackson's spokesman confirmed to Los Angeles Times that he has leased a mansion in Bel Air. Jackson reportedly wanted the property so he could be where all the action is, his manager told the paper. Built in 2002, the home is a French chateau-style estate with seven bedrooms, 13 bathrooms, a theatre, wine cellar and tasting room and 12 fireplaces, according to the Times. Jackson is paying $100,000 a month for the lease, which has been signed for one year, the paper reported. But dont expect Jackson to stay in the Bel Air home forever.